Lucky baker that I am, I just spent three most instructive days baking with Jeff Hamelman at the King Arthur Flour Baking Education Center in Central Vermont (more about this experience in another post) and the rest of the week visiting a French baker who makes extraordinary bread in Northern Vermont (more about him and his bakery in yet another post). When I came home, one of the first thing I did (after dividing my carload of bread between family and friends) was to feed the starter (which had been waiting in the fridge) and set it to warm up in the proofbox. I fed it again twice the next day and on the morning after, it was bubbling away and ready to work. I wanted to showcase the deliciously tangy raw apple cider I had brought back from Green Wind Farm (which also makes the creamiest whole-milk yogurt and a very flavorful maple syrup) and drawing inspiration from Jeff’s Normandy Apple Bread in Bread: A Baker’s Book of Techniques and Recipes, I made this very simple bread. If you don’t have diced dried apples (I had bought mine at the King Arthur store), you can slow-roast the apple slices in the oven at 250 F/120C as Jeff does: it would probably boost the flavor of the cider even more. For a slightly sweeter bread, a splash of boiled cider could be added. Shape each piece of dough as a batard and set to proof in a floured basket for about one hour in a warmish place (the dough is ready when a finger poke leaves an indentation that takes 1 or 2 seconds to spring back). Set to cool on a wire rack. This Vermont Apple Bread goes to Susan, fromWild Yeast, for Yeastpotting. Oh my, I am so envious of you, MC! Vermont in the fall, Vermont cider, Norwich (my former home town), baking with J.H., and this gorgeous loaf. How could life get any better than that? I love it, your doing all the classes I wish I could keep taking! Jeffrey is a great person and baker! 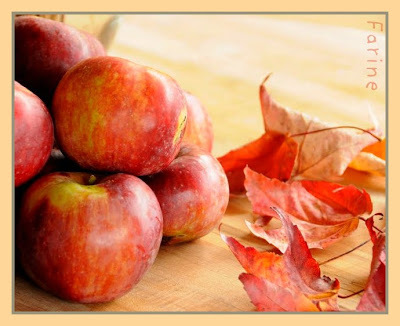 Apples and Vermont are so perfect for the fall season! Lovely as usual, wish my breads weren't having such a hard time coming out as good as yours? Must be a sick levain? Or just some forgotten lessons? ma mère dit bonjour ! That looks beautiful. And I am looking forward to your post on KA baking school – attending is on my "to do" list! Wow. That bread looks scrumptious! The Bread looks great. I like cidre very much, and adding it to a bread sounds delicious. @Susan, isn't Vermont a lovely state? How lucky you are to have Norwich as your hometown! @Jeremy, well, Vermont is closer than SF. Maybe you'll make it to Norwich this year! Please say hi! back to your mom. @Madam Chow, the post on the workshop is out. Let me know what you think. @Mimi, thanks for visiting. I am glad you like the bread. @Teresa, you'll see that one of these days we'll attend the same workshop! It'll be fun to meet you in person. @Flo, je t'en donnerais bien un! @Stefanie, try it and let me know how it comes out.. 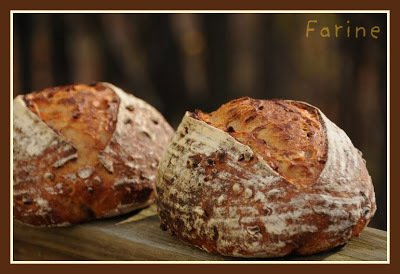 I love the Apple bread..on eof my fav's…. I have taken both of JH classes and loved them both…. Thanks for visiting, Judd! Which two classes did you take with Jeff? I made this lovely loaf, and we're enjoying it still (I love how sourdough doesn't get stale even when left out on the counter!). I notice that almost always when I'm using sourdough, my rising time seems always to be longer than the recipe calls for – yet I have an active and healthy starter (fed daily, always at room temp, no fridge) – ??? But I get nice results and good bread – just always takes longer. Do you think it's just not an agressive starter? Hi,John! So glad you made the loaf and like it. I do think that rising times depend on a lot of different factors. When I made that inedible loaf at the Baking Center, it was pure sourdough and took an incredible time to rise although I had used Jeff's starter (which would most certainly be in the Olympic team if there were such things as Olympic Games for starters)and set it to rise in the proofer. Flour type probably plays a big role (that loaf was 50% whole wheat like this apple bread). 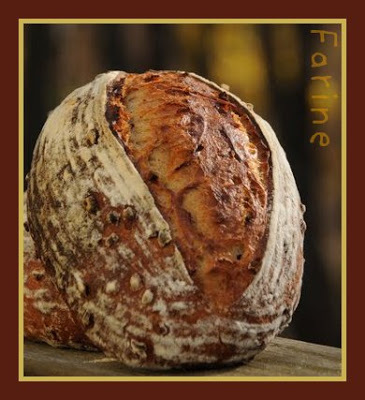 I just ordered from France a master's or doctorate's thesis on bread fermentation. If there are any clues there, I'll be sure to pass them along. I HAVE MADE THIS BREAD TWICE NOW — THE FIRST TIME USING ONLY SD STARTER — IT ROSE VERY LITTLE AND WAS VERY DENSE — HAD A GOOD FLAVOR BUT VERY CHEWY — SECOND TIME I ADDED 1TSP OF INSTANT YEAST AND AFTER THE SUGGESTED RISE TIME THE BREAD APPEARED TO BE OVER PROOFED — I BAKED IT ANYWAY AND IT WAS BETTER BUT STILL DENSE — ANY SUGGESTIONS? Hi Tony, I just broke my wrist and can't really type long. 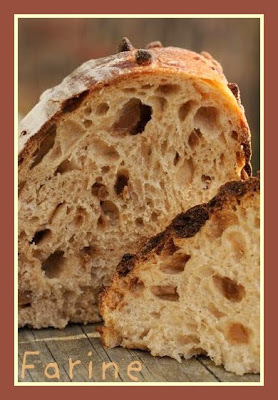 So many factors go into the making of any bread that it is impossible to give you an answer. Re: overproofing though. Considering the heat of summer which hastens everything, I would try shortening the fermentation.